Above: Queenhithe (Dock) photographed in 1959. The large Victorian warehouse in the centre of the dock was known as Smith’s Wharf. The name of ‘Queenhithe’ today refers essentially to three concepts: (1) The ancient dock by that name. (2) Just to the north of the dock is a street called Queenhithe. (3) The third use of the word is in the Ward of Queenhithe which, obviously, takes its name from the dock. In this article we shall concentrate on the history of Queenhithe as a dock. Queenhithe was a thriving Saxon and medieval dock and is the only inlet now surviving along the City waterfront today. 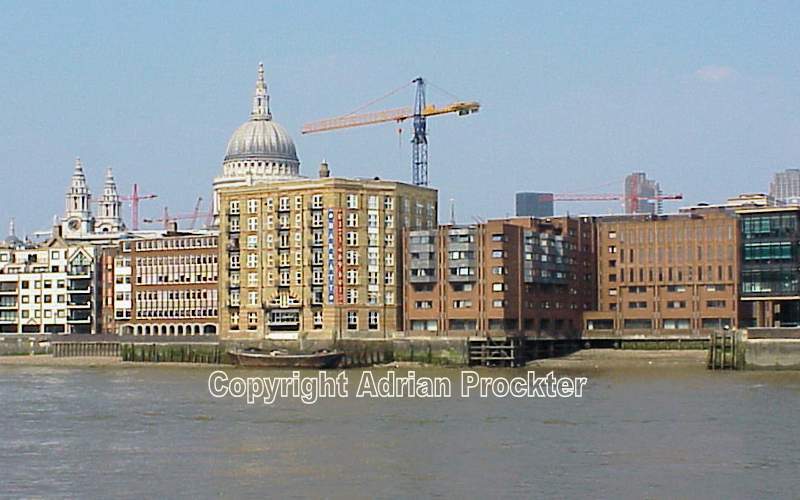 In Saxon times a second dock was also cut into the river bank at Billingsgate which remained until Victorian times when the dock was filled in and a new building called Billingsgate Market was erected on the reclaimed land. By the 9th century Vikings were occupying the land inside the Roman Wall. In AD 886 the land inside the Roman Wall was reoccupied by King Alfred the Great. Alfred drove the Danes out of the City and is assumed to have established the street pattern to the south of Cheapside. A few years later, in AD 899, a harbour was established at ‘Ethelred’s Hythe’ – which we now call Queenhithe. It is recorded in contemporary charters as a trading shore, where goods were sold directly from beached boats. The harbour became known as ‘Queenhithe’ when Queen Matilda, wife of Henry I, was granted the dues from the dock in the early 12th century. This right was inherited by successive English queens. By the 13th century it had become the principal dock for handling grain and other foodstuffs to feed London’s growing population. Some time around 1250 Henry III ordered that all corn and fish should be brought to Queenhithe, to supply the City markets. Just north of Queenhithe was Fish Street Hill which is a reminder of those days. This led to Friday Street, part of which still remains, where fish was sold to the public for the traditional Friday meal. Records show that the market at Queenhithe was hindered by slowness of the bridge attendant in raising the draw-bridge of London Bridge. Ships therefore were reluctant to go through London Bridge to unload at Queenhithe. The dock therefore declined in the 15th century in favour of the better facilities for larger vessels at Billingsgate downstream of London Bridge. 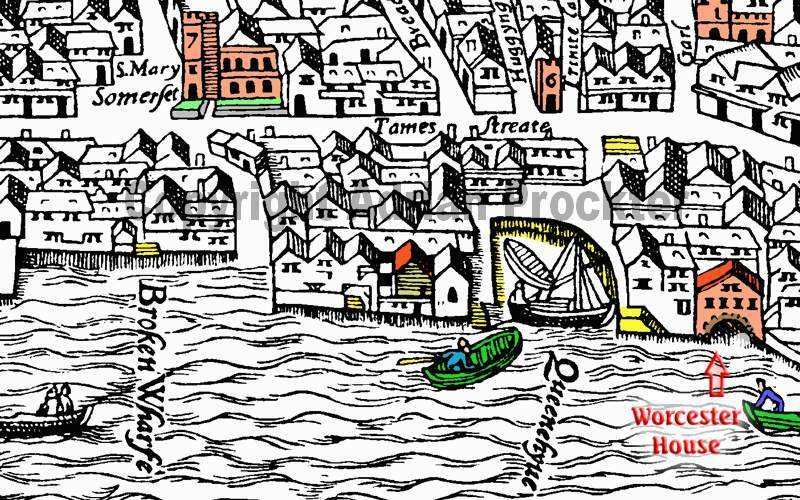 Above: Queenhithe shown on the Agas map of c1561. Notice the vertical lines along the quayside which probably represent the vertical timbers supporting the edge of the quay (as seen in the article about Trig Lane). The house shown standing over a large arch, beside the Thames, was once the residence of the Earl of Worcester. John Stow says it was ‘divided into many tenements’ in his time. In early times waterfronts were constructed in timber. After the 14th century waterfronts began to be built in stone, which lasted much longer, and the process of reclaiming land slowed down. By the 18th century most of the waterfront in the City had reached the modern alignment. Today, remnants of the Victorian use of Queenhithe (Dock) can be seen at low tide on the foreshore. These are barge beds, constructed to level and stabilise the foreshore for berthing flat-bottomed barges, which transported goods to and from the warehouses lining the waterfront. The dock was surrounded by large warehouses during the 19th and 20th centuries. The grand old warehouses remained until the 1960s. 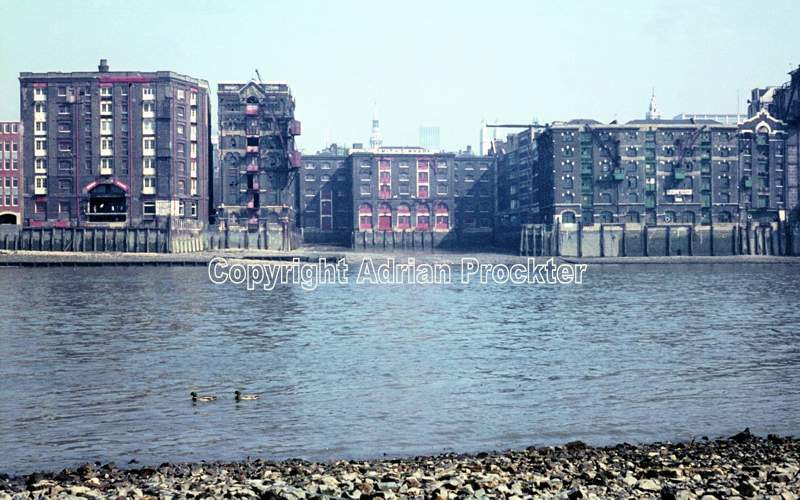 In the 1970s all but one (Brook’s Wharf, on the west side) was demolished and new office and residential developments replaced them. At the same time the narrow Upper Thames Street was widened into the dual-carriageway that we see today. The ugly, overbearing red-brick development is (as of 2015) is being demolished and a hotel complex will replace it. It is hoped that the new building will be a little more sympathetically designed to reflect the remarkable history of this part of the City riverfront. The dock is a national ancient monument and it is believed to be the last example of a Saxon dock anywhere in Britain. For subscription members there is a pdf to view which includes images of Queenhithe Dock and a few places nearby. This entry was posted in /City-Queenhithe, /Thames. Bookmark the permalink.